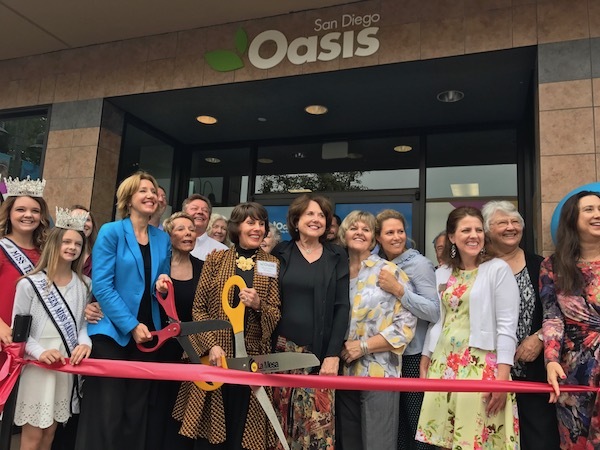 San Diego Oasis, a local branch of the nonprofit organization Oasis, which promotes successful aging in adults over 50, had its ribbon-cutting ceremony in La Mesa on Wednesday, June 7. The organization is excited about its move to the Grossmont Shopping Center in hopes of being able to reach more senior community members. The event attracted over 500 people from local San Diego communities interested in learning more about what Oasis has to offer. Event attendees were eager to hear about the weekly dance, art, and technology classes being offered. Oasis was founded in 1982 by Lifetime Director and Founder Marylen Mann and since then has expanded across the United States to cities like San Diego, providing older-aged adults with health and learning programs as well as volunteer opportunities. State Senator Joel Anderson provided a Senate certificate of recognition to honor the organization for bringing senior community members together. During her speech, Mann recognized the noteworthy research on successful aging that has been conducted by the MacArthur Foundation. Mann points out that according to the foundation’s study released in 2010, components proven to help with successful aging are healthy habits, which include diet, exercise, volunteer work, and connection with others. Mann said that Oasis promoted those things through their diverse programs for 28 years before that study was released. For more information about San Diego Oasis and the programs offered, visit oasisnet.org/San-Diego-CA. —Lauren Smith is a legislative intern for Senator Joel Anderson and a senior at San Diego State University studying Recreation Administration and Sustainable Tourism Management.